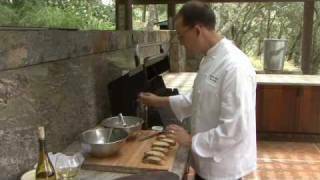 Chef Brian Streeter's recipe for bruschetta using Gourmet Mushrooms and Bellwether Farm's sheep's milk ricotta, and paired with Cakebread Cellars Chardonnay Reserve. Place a large non-stick sauté pan over high heat. Add the 3 T. olive oil and the mushrooms, stir well and sauté the mushrooms for 4-5 minutes. Once they begin to brown, add the garlic and fresh thyme. Continue to cook for another couple of minutes. Add the lemon juice and season with salt and black pepper. Remove from the heat, place in a bowl and allow to cool. In a mixing bowl, combine the ricotta with the chopped herbs and a little salt and black pepper. Mix well to incorporate and set aside. Meanwhile, slice the country loaf into ½ inch slices and brush lightly with olive oil. Toast over a hot grill or under a hot broiler until light brown in color, turn and repeat for the other side. Remove from the oven, and rub one side with the garlic clove. To assemble, spread a small amount of the herbed ricotta on the crostini and top with the sautéed mushroom mixture. Serve immediately. *Gourmet Mushrooms is a grower of mushrooms in Sebastopol, CA. They grow a wide range of mushrooms. They may be available in some finer grocery stores labeled under the name mycopia or ordered at www.mycopia.com. You can successfully substitute other varieties of mushrooms like shiitake, maiitake or chanterelles. **Bellwether Farms is a sheep’s milk dairy in Petaluma, CA. Their sheep’s milk ricotta can be found in some finer cheese counters. Substitute another high quality ricotta if unavailable.